The upper part of Chad covers a big part of the Sahara Desert and is known as the Borkou-Ennedi-Tibesti Region. In the northeast the Ennedi Desert or the Ennedi Plateau covers one third of this region and is a beautiful place to visit with a desert safari or camel tour. We decided to discover the Ennedi Plateau by jeep and arranged for a camp safari with overnight stays in the Sahara Desert of Chad. I could have never hoped for a better desert safari or Chad experience as the one we were able to live during our Ennedi adventure. The rock formations were amazing and I remember feeling a true explorer when our guide showed us the first rock art painting crossing our path, beautiful! Representing all kinds of animals held by the desert people in the past and some even today we gazed at these gorgeous red brownish rock paintings. It would be impossible to choose one feature of our Ennedi Desert experience which impressed me the most because the whole journey was so intense and different from other travels. Driving around over the red Sahara dunes was a joy on its own but camping out in the middle of nowhere, lighting a fire and experiencing nature this upclose was maybe the best part. We got to meet the people from some desert villages or camps and visited some stunning sites like the Guelta d'Archei where we arrived after a few days of travel, a beautiful wetland in the Ennedi Plateau near the town of Fada. We watched the camels bathing in the fresh lake and had the opportunity to watch an isolated group of crocodiles who live right here in the Sahara! How amazing can nature be? Our guide told us the Sahara crocodiles feed themselves on fish swimming in the lake and which, feed on the camel poo left behind in the bathing water! The formations and lake of Guelta d'Archei is maybe the most popular and unique one in the Ennedi Region but we visited a lot more of these Sahara Oasis, especially near the town of Ounianga Kebir. Did you enjoy Ennedi Desert Safari in Chad and have you been on a holiday in Ennedi, Chad? 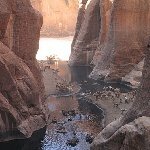 Where to stay in Ennedi: There are several campsites we stayed at like the Abaike campsite which was a favourite. What to do in Ennedi: Enjoy the ride and the stunning lakes on your path! Where to eat in Ennedi: We cooked our own meals. Liked: The people we met, the stunning and immese nature and not to forget the unique campsites! Disliked: Nothing, luckily we had no problems at all during our Sahara experience.